On April 17th, 2018, the Vegas Golden Knights defeated the Los Angeles Kings 1-0 to sweep the first round of the Stanley Cup playoffs. While it is impressive for any team to sweep another team – to win all of the games in a round without losing – the Knights’ sweep of the Kings was anything but probable. To the shock of the nation, the Knights ended the season as the second overall team in the NHL, leading the Pacific Division with an entirely unprecedented 51-24 record. Vegas made history as the only team in NHL history to make the playoffs in an inaugural season. However, the team ended the season on a sour note, as they lost two back-to-back games to a team that may prove to be a tough division rival for years to come: the LA Kings. Tensions were high when the playoffs began, with the Knights determined to learn from their losses and get back to their winning ways from the regular season. 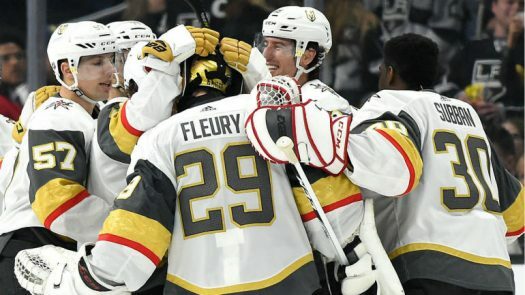 Game 1 saw the Knights score one goal to win 1-0, with a whopping 30 saves by Vegas’ all-star goalie, Marc-Andre Fleury. Game 2 went into double overtime, where Vegas’ Erik Haula scored a game-winner at 15:23. Game 3 saw a total of four goals scored in the third period, with the final score ending at 3-2 Knights. In Game 4, Fleury pitched his second shutout of the series, and the Knights won 1-0. The Golden Knights dominated the Kings in Round 1 and will advance to play the San Jose Sharks, a fierce team that also swept their previous opponents, the Anaheim Ducks. If the Golden Knights beat the Sharks, they will move on to play either the Nashville Predators or the Winnipeg Jets (assuming that those series don’t have surprises). If the Golden Knights can beat either of those teams, they’ll be in the finals, a dream-scenario potentially only about a month away. The Knights’ performance against the Kings suggests that they are certainly in the running. The defense was quick to block shots and clear pucks. The offense was relentless, keeping constant pressure on the puck. Goalie Marc Andre Fleury played brilliantly, only allowing three goals in four games. The Golden Knights proved that they are able to compete with the best of the best. Remember those 200-1 odds? The sports books have dropped those to a cool 4-1 odds for the Knights to win the Stanley Cup Finals. The Vegas Golden Knights will begin their seven game series against the San Jose Sharks at home on either April 26th or April 27th.